Why purchase herbs from the grocery store when you can grow your own at home? For a convenient oomph of flavor whenever your meal needs a boost, plant herbs in your own garden or containers. 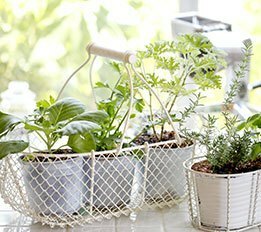 Home-grown herbs are less expensive and fresher than their store-bought counterparts while being surprisingly easy to grow and maintain. Study the following list of seasoning suggestions that any gardener can plant. Rosemary is delicious when combined with other herbs or used on its own. 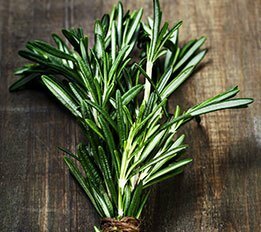 A very versatile plant, rosemary enhances meats, vegetables, soups, sauces, bread, marinade, and oil. With its woody stems and needle-like leaves, rosemary may seem evergreen, but it needs to be brought indoors for the winter. Outdoors, seedlings should be planted two to three feet apart. Rosemary thrives in full sun and moist soil, as long as it’s given the chance to dry out between waterings. Dry rosemary is also very valuable, in fact. Hang the herbs upside down in bunches or use racks to dry rosemary. Because of their lovely scent, dried rosemary leaves are perfect for bouquets, wreaths, and sachets. Whether you dry, refrigerate, freeze, or preserve thyme, it will prove its usefulness. Butter, mayonnaise, meat stew, strong vegetables, dried beans, and slow-cooked foods can all benefit from a dash of thyme. Not only is thyme aromatic, it makes for an attractive groundcover. When exposed to full sun, thyme produces pretty white flowers and flavorful leaves. 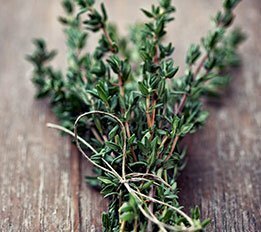 Lemon thyme works well with tea, seafood, and anything else that tastes especially good when given a citrus kick. 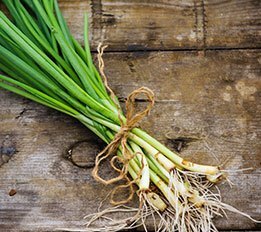 Grown for their leaves and flowers, onion and garlic chives are members of the lily family. Full sun encourages chives to flourish in clumps, which can be divided later. When harvesting chives, save half an inch of growth to preserve the plant. Chives lose their flavor when they’re cooked, so add them to dishes at the end of the process. Onion chives produce edible purple flowers, which can be floated in soup. To enjoy chives year-round, overwinter containers or freeze the leaves. 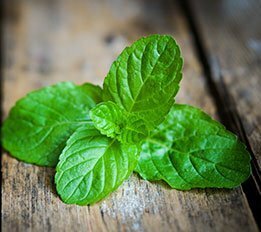 There are many varieties of mint, including sweet mint, spearmint, peppermint, and chocolate mint. Each type spreads quickly, so limit its growth by planting mint in a container if need be. When gathering mint, pinch off the stems. The sprigs complement lamb, fish, poultry, and vegetable dishes. You can also make salads and beverages even more refreshing by adding this herb. Dried mint potpourri and sachets are also very popular. 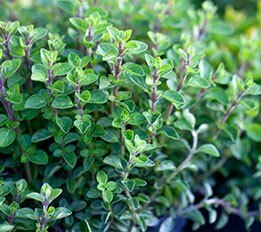 Oregano makes for a delicious herb as well as an attractive trailing container plant. Harvest oregano in mid-summer, before it’s had a chance to bloom; the herb’s aroma and flavor are strongest at that stage, especially when dried. Oregano is common in Italian and Greek cuisines. Meat, fish, eggs, cheese, tomatoes, and vegetables all taste even better when prepared with oregano. Add fresh oregano at the end of the cooking process and add dried oregano when simmering. Parsley is often thought of as a garnish, but it’s much more versatile than you may think. 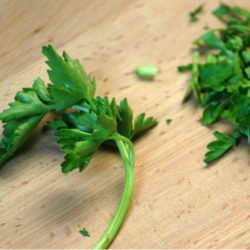 Curley-leaf parsley is the variety traditionally used as a garnish. The flat-leaf variety is the better choice for cooking and is often used in European, American, and Middle Eastern dishes. It is often included in recipes for sauces, soups, salads, rice, and vegetables. It pairs well with most fish and meat dishes. Parsley is rich in iron, vitamins A and C, fiber, and because of its unique flavor it often reduces the need for salt. When planting tomatoes consider planting a parsley plant nearby. Beneficial insects to tomatoes are drawn to parsley. If the taste doesn’t please your palette, grow it to attract swallowtail caterpillars and butterflies. They love parsley! Not only is cilantro tasty, it’s low-calorie, potassium-rich, and good for the digestive system. Fresh cilantro is best, which is why cooks prefer to grow it themselves. Cilantro has an easier time reseeding when it’s given space, so save room in the herb garden or the corner of a vegetable garden. 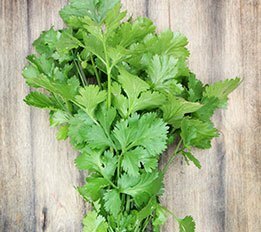 To keep your crop strong, avoid harvesting more than one-third of your cilantro at once. This herb also produces coriander seeds, which make for excellent curry.